Homemade peanut butter cookies with scoops of vanilla ice cream, with fresh bananas mixed right in! Perfect for parties or after school snacking, and so easy to make. 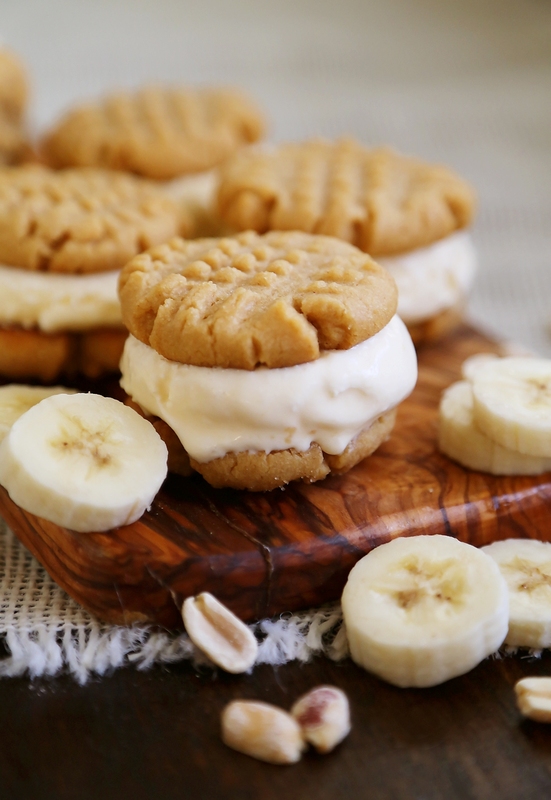 You will love these peanut butter-banana treats! What is it about the combination of peanut butter and banana that is just so scrumptious? Whether on a sandwich, served as bite-sized snacks, or blended into a pie, you cannot go wrong with the classic combination of creamy peanut butter and sweet banana slices. Now, I have another irresistible idea for you featuring this happy marriage of flavors – and this one includes ice cream! I can hardly believe I haven’t shared my favorite peanut butter cookie recipe with you until now. So, I thought that I would not only share that melt-in-your-mouth cookie, but a fun way to really amp up the flavor. 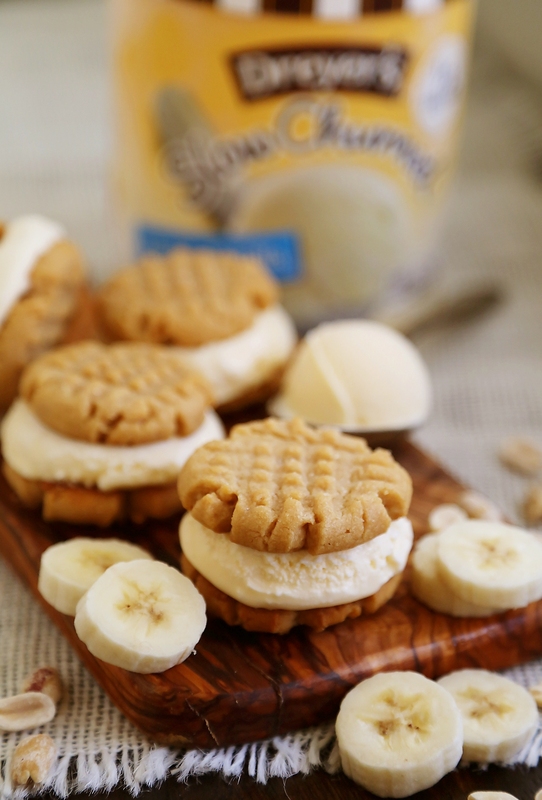 Enter my all-time favorite light ice cream swirled with fresh banana bits and sandwiched between two peanut butter cookies. Perfect for after school snacking, post dinner indulging, party snacking, or any occasion that brings peanut butter lovers together. This recipe is not only about making a peanut butter cookie better, but it’s about turning an already terrific ice cream into an irresistible treat! You’ll rarely find me strolling the grocery store without a carton of Dreyer’s Slow Churned Classic Vanilla light ice cream in my cart. It is, hands-down, a brand I cannot live without, and the vanilla flavor – with its rich, creamy texture and warm fragrance – is always the one I reach for. It tastes like pure decadence on its own (with half the fat and one-third the calories of regular ice cream), but can be made even better with a few simple additions. Just today, I enjoyed a bowl with a drizzle of chocolate sauce and toasted Texas pecans – heaven! 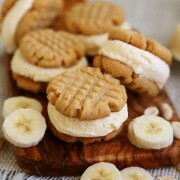 Combining the vanilla ice cream with chopped bananas is definitely my most recent favorite twist on the classic flavor! Simply let your ice cream soften a bit, then chop a couple bananas and fold them into the ice cream with a rubber spatula. You can also use a large food processor for this. 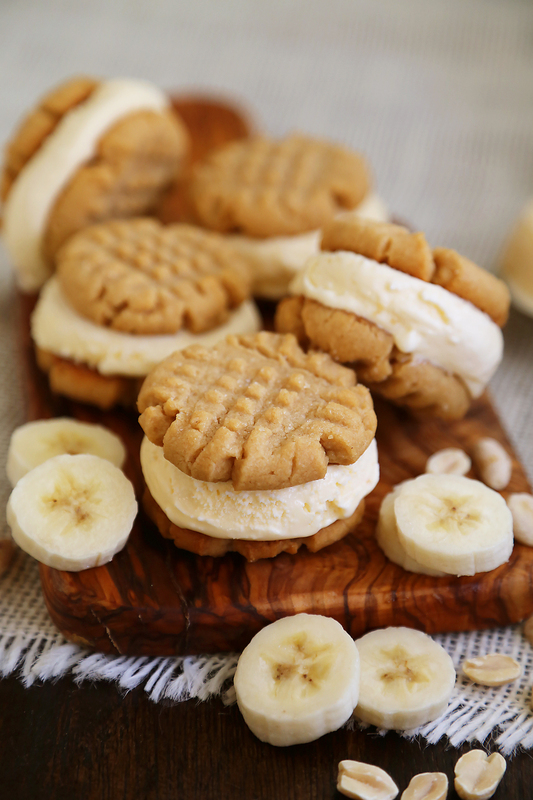 Once the banana and ice cream are well blended, scoop out the ice cream and sandwich it between two peanut butter cookies. If you’re not serving right away, pop them in your freezer until ready. Kids and adults alike will love these tasty peanut butter-banana treats anytime of year. I hope you enjoy this recipe, and let me know how it turns out for you, if you try it! In a large bowl with an electric mixer, mix butter, peanut butter and both sugars on medium speed, until well blended. Add egg and beat well. In a separate bowl, whisk flour, baking soda, baking powder and salt. Add to butter mixture, blending well. Scoop walnut-sized (about 1-inch) balls of dough and place on prepared baking sheet. Gently flatten with a fork dipped in sugar, making a crisscross pattern on each. Bake 8 minutes. Let rest on pan for a few minutes, then remove to a wire rack. Cool completely before adding ice cream. Combine ice cream and banana until well blended. Scoop 1 tablespoon ice cream onto 1 cookie. Top with another cookie, gently pressing together to make a sandwich. Place on a baking sheet and freeze for 1 hour, or until firm. Disclosure: This is a recipe created for Dreyer’s Ice Cream. I was compensated for my time but all opinions are my own. These look delicious! I would grab a way more than just one. There is something about the fork marks on top of peanut butter cookies that gets me every time. 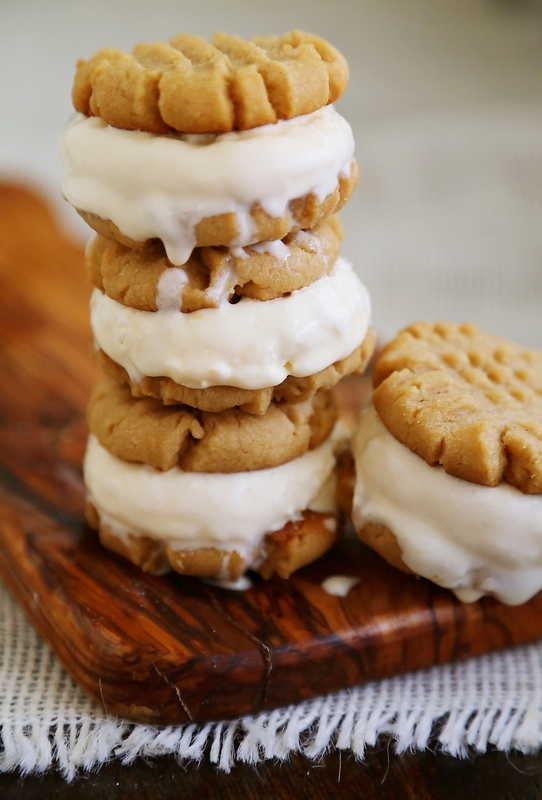 These look like little nut butters, yum! Peanut butter and banana is one of my favorite combos. I make something similar, but with banana soft serve and eat wayyy too many of them every time! 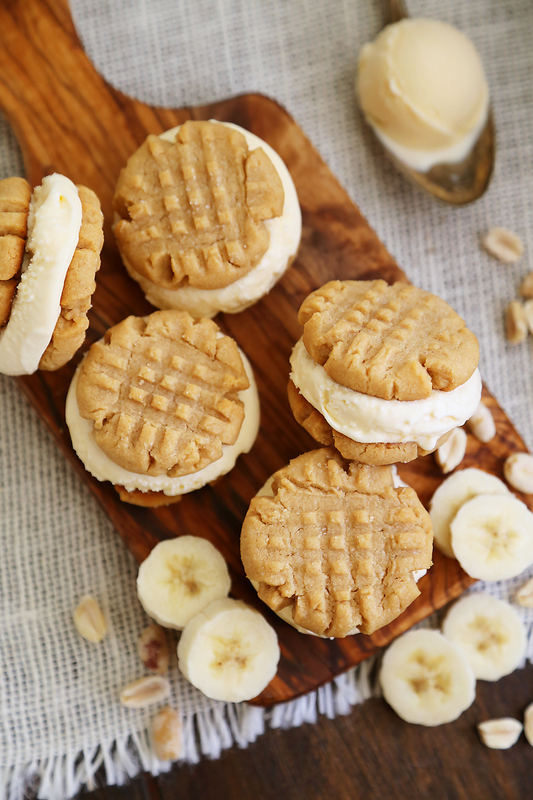 I love PB + banana, and these cute cookie sandwiches look too good to pass up! or even I fulfillment you get entry to persistently rapidly. If you have the cash, look at getting a maid to aid using the housework. You’ll be amazed at just how much time homeschooling your youngster will take. This simply leaves you with almost no time for housework. Trying to manage the home, your young ones, along with your kid’s training might be a lot of on your own shoulder area. A maid can certainly help you out. As a way to stop smoking, get something else you may hold inside your hand and set with your mouth. A lot of people who smoke struggle to give up mainly because they offer an need to possess a smoke in their palms and mouth area. Instead of a tobacco cigarette, you can keep onto a straw. If you realise your self having difficulty recalling details, require a deeply breath and relax. At times all you need is much more time for you to give your memory space to get the details. Sensing pressed for time could lead to stress that inhibits the recall process. Understand that the old you might be, the longer it takes to get information through the storage.